gallupARTS is proud to present “Challenge Gallup: A Native Artist Group Show for Social Justice” at ART123 Gallery. Opening on Saturday, July 14 from 7 – 9pm (during ArtsCrawl) and running through Saturday, August 4, Challenge Gallup spotlights 11 Native artists whose work tackles timely and relevant social justice issues, from homelessness to diabetes to environmentalism to stereotypes. 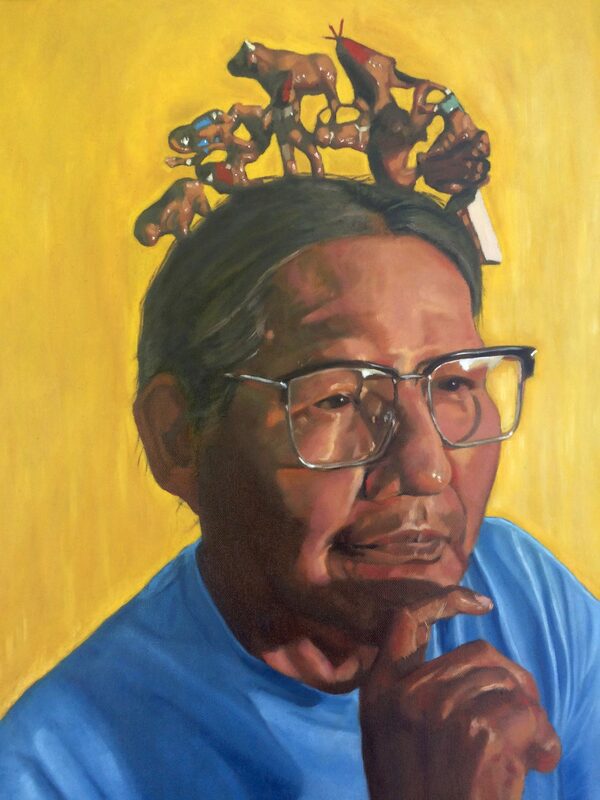 For example, Diné painter Adam Maria, calls attention to (in his words) the “epidemic of Type 2 diabetes in the Navajo community,” by juxtaposing food contributors to diabetes with natural lifestyles. In his painting “Type 2,” he contrasts a crushed soda can with a blue bird. “My aim is to depict chaos and balance in the same frame,” Maria says. In doing so, he hopes to pinpoint the underlying causes of diabetes—cheap and commodity foods, and a loss of cultural bearings. Diné painter Jerry Brown addresses the “unwritten, unspoken expectations for ‘Native art’ from Native artists.” Brown says, “the stereotyped expectation that the only art I can or should create is art that portrays images of my culture is no longer acceptable.” Brown’s colorful and abstract paintings, such as “Soul,” break the mold.